A dry-erase board in the back of a CT Pregnancy Resource Center reads, “Pray for Formula.” Just last week, a woman came into the center looking for formula for her baby. She told the center volunteers the formula she usually receives from the government-funded “WIC” program wasn’t available to her because of the partial shutdown. WIC, or The Special Supplemental Nutrition program for Woman, Infants and Children, is a government-funded program that provides millions of low-income pregnant women, recent moms, and their kids from newborn to age five with formula through federal grants. In 2011, WIC statistics show that states reported average monthly participation was almost 9 million people per month. Out of that 9 million, almost 5 million are children, 2 million are infants, and 2 million are women. Surprisingly enough, WIC serves 53% of all the infants born in the United States. Along with supplemental nutritious foods, WIC offers nutrition education and counseling at WIC clinics as well as screening and referrals to other health, welfare, and social services. WIC has 1,900 local agencies in 10,000 clinic sites, in 50 state health departments, five territories, and 34 Indian Tribal Organizations. WIBW News out of Topeka, Kansas writes about 70,000 Kansas residents who are relying on the WIC program to help feed their families. The Topeka online publication tells the story of a mother of two, Julie Sutton, who cannot afford to buy milk now that the Kansas Dept. of Health and Environment directed her WIC office to hold her checks for Nov. and Dec. until the shutdown ends. The Oklahoman reports that 90,000 infants, children, and mothers in Oklahoma receive WIC benefits every month. Terry Bryce, director of Oklahoma’s WIC program, states, “We serve a very vulnerable population…over 50 percent of the infants born in the state of Oklahoma are on the WIC program, and that’s true not just for the state of Oklahoma, but for the nation as a whole.” News stations are reporting similar stories from Utah, where WIC programs could shut down on Nov 1, to North Carolina, where they are depending on funds left over from last fiscal year to continue the feeding program. Americans have interesting responses in regards to this situation. Some people are filling the comment sections of news articles with angry rants on the need for low-income women to “get jobs.” Those comments are an insult to the many working moms whose income still isn’t enough to provide for their children. My own mother is one of the hardest-working women I know. She tirelessly labored during my adolescent years to provide for my brother and me as a single parent. Although I never went hungry or suffered lack, I clearly remember a time when my mom asked me to borrow one dollar from my piggy bank to help purchase a gallon of milk for our family. I clung to my dollar bill, not wanting to part with it, because I was ignorant of reality of financial hardships my mother faced. Eventually through much coaxing, I relinquished my dollar and our need was met. Last week, I posted a story on my Facebook account about the WIC programs funding problem and how it was hurting those in my state. A friend who is getting her law degree at UConn saw my post and took action. My friend Ashley Randall is a member of UConn’s Black Law Student Association group. 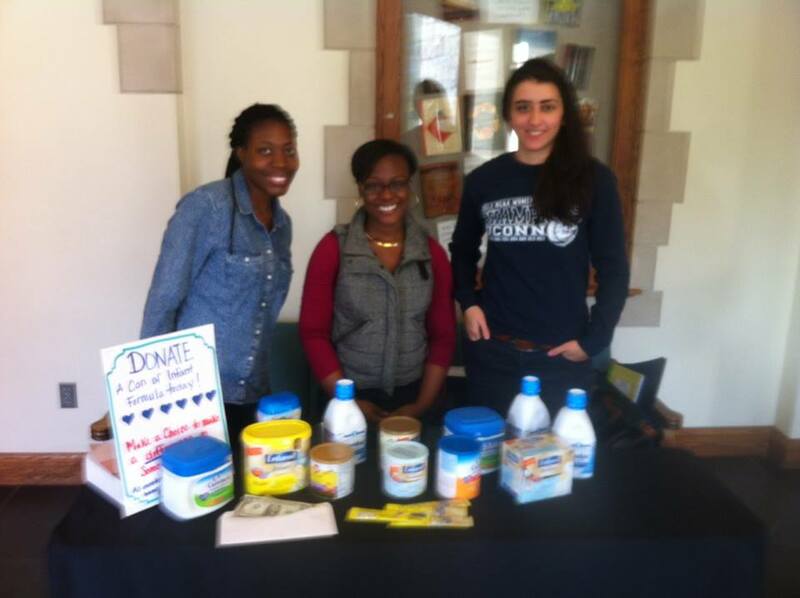 She rallied her group, and they held a formula drive on campus this past Monday. The group raised $200 and 12 containers of name-brand formula. All of the funds and formula will go directly to a pregnancy resource center in CT that will freely distribute it to women and families in need. This is compassion in action. The government shutdown is hurting families in our country. We can complain about it, argue over politics, or chose to do something productive. If you’re interested in helping families in need, buy a container of formula and donate it to a pregnancy resource center, soup kitchen, shelter, battered women’s home, or any organization in your city that assists low-income families. Jesus said, “Whatever you do the least of these, you do to me.” I believe that the love we show towards the most vulnerable in our society is a love that touches the heart of God.